Steve Pendery and Jeff Kidwell. On Saturday in Northern Kentucky University's Ballroom, the Campbell County Republican Party will elect five new members to help steer the direction of the party. That will end a nine-year run for current Chairman and former Sheriff Jeff Kidwell, who has chaired the county Republicans since 2008. He is not expected to be in attendance. District 4 Chairman, Troy Sheldon, will likely chair the meeting in his stead. The other members of the executive committee are also not seeking reelection in Wini Stine, Kevin Sell, Pete Garrett and Elizabeth Kidwell. It's estimated that close to 400 county Republicans will come to the meeting where party members will elect up to three precinct officers in all 68 precincts. Those members will then choose the next five executive committee members who will lead the party for the next four years. Because of the expectation for a larger crowd, the venue had been moved from the Wilder City Building. The Campbell County Republican Party has experienced unmitigated success over the last five years since the last county executive committee was elected. Nearly every elected office in the county is held by a Republican. "We're on an incredible streak as a party," said Campbell County Judge Executive, Steve Pendery. "There's a huge advantage of having an "R" by your name when you go to compete for a position in a typical November. If you look at what's happened in northern Kentucky with the contributions of Republicans regionally, the results have been spectacular by the measures applied to the other 120 counties in this state." Current Campbell County Executive Committee Member and two-time 4th District Chair Kevin Sell agrees. "We successfully transitioned our county to be Republican and there is plenty of money in the coffers. Every elected county office is Republican except one. It was a hell of a good run," he said. But some would describe the current state of affairs in the Campbell County Republican Party as a fractured, at best. In 2012, when a handful of tea party activists who had supported Libertarian candidate for state treasurer, Ken Moellman, they were barred from being elected to party offices during the Campbell GOP reorganization. A red star was put on the corner of the index cards they used to register at the county reorganization, to indicate they were ineligible for leadership. The fallout has been well documented and argued since then, but the chasm between the two contigents began to grow. 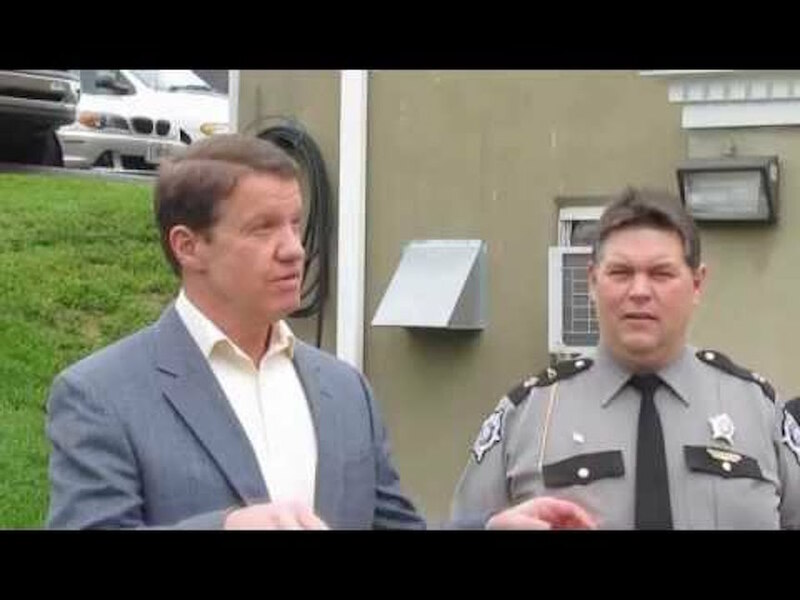 A few months later, Campbell County Republicans picked Kidwell, its chair, as the party's nominee in the special election for county sheriff, when John Dunn retired. Tea-party officials say that Kidwell manufactured that nomination. He vehemently disagrees. Kidwell has not returned calls for this story. The rift grew further in 2014 when county activists tried to overtake the executive committee. 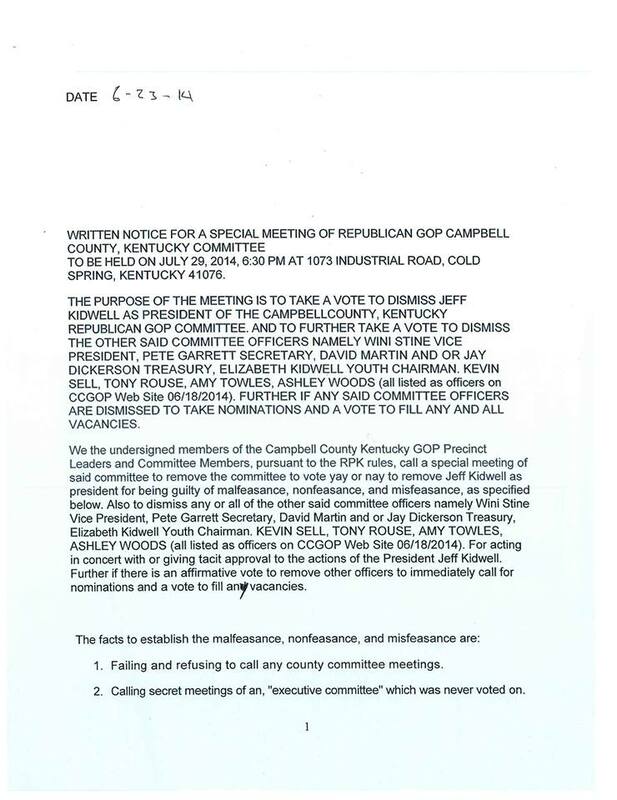 That group voted in July to throw out all 10 of the Campbell County Republican Party leaders and replace them with new officers citing 20 instances of “malfeasance, nonfeasance and misfeasance.” The Republican Party of Kentucky had to step in and ultimately rejected the ouster, which affirmed the legitimacy of Kidwell and the current GOP leadership in the county. Under a normal cycle, the reorganization would have occurred last year in 2016, but the Kentucky Republican Party gave the current leadership an extra year so that Republicans could caucus in Kentucky. Even that became a point of contention between Republican factions in Campbell County as a tea-party led effort successfully voted down two delegate slates proposed by the party leadership. Slates of delegates offered by tea party leaders in the counties beat out slates with established Republicans. "There is room for improvement in my opinion and I think we've all learned lessons in recent years about how to handle local party business that I hope the new officers will learn from," said Pendery. "The past officers did a good in a lot of respects, but there are new challenges and fresh thinking is required, so it's fine to have new people come in and accept those challenges." It's hard to argue against the fact that the tea-party in northern Kentucky has been gaining momentum. They have been known for their ability to organize and recruit members and in bulk. Larry Robinson, a former tea party leader in Campbell County, has been inviting Republicans to weekly meetings leading up to the reorganization to help them understand the process. "Everything has been transparent and open. We want people to be able to express their concerns about previous elections and to be able to implement new ideas moving forward. The role of the county GOP should be to elect the most qualified, true Republicans into office," he said. Sarah Cameron, who was recently appointed to the Kentucky Commission on Women by Governor Matt Bevin, has also been involved with the reorganization effort. "I'm excited that we have this opportunity to reshape our party," she said. "Given the caliber of conservatives who live here, Campbell County has the potential to be one of the strongest county parties in the state." So what will happen on Saturday's county meeting? It may come down to a numbers game. Tea party versus establishment. County versus city. North versus south. Whoever can get their supporters into the all-important precinct captains seats that control the votes will ultimately determine who'll lead the county Republicans for the next four years. "I expect there to be some chaos at the reorganization on Saturday because of how previous meetings like this have played out," said Robinson. 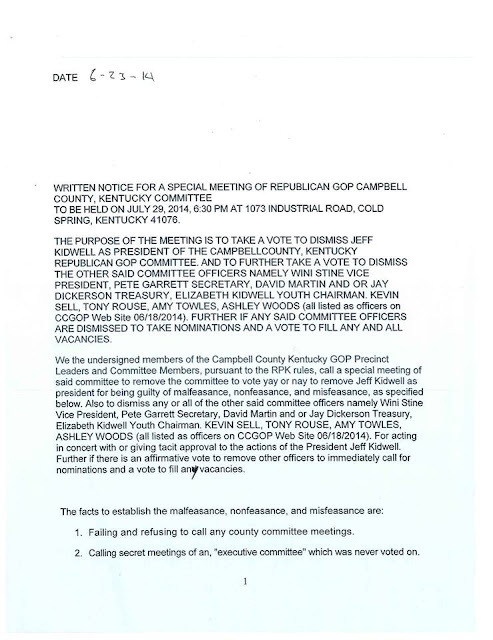 The letter (dated 6-23-14) signed by a group of Campbell County activists that attempted to take control of the Campbell County executive party. Click to view in larger window. All three northern Kentucky counties will be holding their county reorganizations on Saturday. Registration starts at 9:00 a.m. and the meeting begins at 10:00 a.m. The GOP created a new rule in 2012, in secret, and applied it retroactively. That was a bad move. I did tell the Rs they were making a terrible mistake trying to oust the Tea Party folks. They didn't listen. So, whatever. I still believe that we need to get rid of the useless State Treasurer's office, and replace it with a computer program. The LPKY now has ballot access through 2020, so who knows what the future will hold. I have concerns about our county being a sanctuary county. Could this lead to loss of funding for schools, roads, etc? Is there any transparency as to who is filling the republican coffers? I read an alarming article recently about how much out-of-state money flows to local republican candidates. Its alarming and suspect. Why do people out-of-state have an interest here? It is a guarantee there will continue to be ZERO transparency in the operation of the Republican Party as of today and the next 4 years. Can you actually believe that true representatives of our voting districts which are Precinct Captains & officers, were not approved as voting Representatives of the Party. County Judge Pendery took control of the floor and explained it would be inconvenient for actual elected Precint Chairpersons have voting rights and participate in formation of the Republican party goals for the next 4 years. A very sad day for transparency and inclusion in the County Republican party. Instead a "Executive" Committee consisting of 5 elected officers from todays meeting and a additional 4 people hand picked by the executive committee will be running the show behind closed doors again. This certainly eliminates true representation and participation by the majority of Campbell County Republicans.